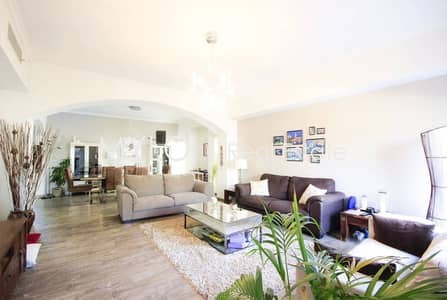 Laura and Mylo Real Estate are proud to offer our clients the opportunity to rent this owner-occupied Type 2 Deema villa with a 4019 sq ft BUA. This type of property is highly sort after with our clients in the established community of The Lakes and has been fully upgraded to the highest of european standards. The main foyer opens onto a large living and dining area leading onto a fitted kitchen with family area. The ground floor consists of a guest bathroom, laundry room and maids’ quarters. From the kitchen, there is access to a large established and well-maintained garden. Upstairs there are 4 double bedrooms all with ensuite washrooms and fitted storage throughout, the master bedroom benefits from having a walk-in closet. Outside the property, there are 2 covered parking spaces. Deema villas are set in landscaped common areas with parks and pools, lakes and water features and BBQ areas. Just a short walk to the Lakes Club with a selection of Restaurants, coffee bar, shop, and fitness club.